PASADENA, CA-So it all came down to one play after all. Well, there were many plays that played a part in altering the outcome of the 100th Rose Bowl played in Pasadena, California. But there was none as big as the one that No. 4 Michigan State put down on No. 5 Stanford with time winding down in the fourth quarter. But let’s set up a precursor to that play in which linebacker Kyler Elsworth decided to go Walter Payton through the air to submarine Stanford running back Ryan Hewitt. The Spartans had to play the entire game without their defensive leader and All-American linebacker Max Bullough. The thought process among many of the pundits and analysts was that the Michigan State defense was toast without the services of Bullough. After Tyler Gaffney and Stanford took its opening possession and scored, that theory looked as though it may come to fruition. When the Cardinals went up 17-7 following a pick six thrown by quarterback Connor Cook, the Spartans appeared to be another Big Ten school wilting under the pressure of the bright lights that comes along with playing on the national stage of the Rose Bowl Game presented by Vizio. Cook and his teammates had better ideas, shaking off that early deficit to roar back with 17 points of their own to take a 24-20 lead down to under two minutes in the game. The stage was set for Michigan State’s stalwart defense to really show what it was about in trying to deny quarterback Kevin Hogan and Stanford a chance at winning its second straight Rose Bowl game. What the Spartans proved on the Cardinals’ final drive of the night was that there is a reason why they are the best defense in the country. On fourth-and-one, Stanford-and their big, physical offensive line, along with Hewitt-was pushed back by the determination and will of the Michigan State defense. That sealed the deal for Michigan State to come away with a 24-20 win in front of a massive sea of fans draped in their green and white. But the Michigan State (13-1) wasn’t without its share of problems early on. As a matter of fact, for a while it looked like this would be a Cardinals’ celebration night. 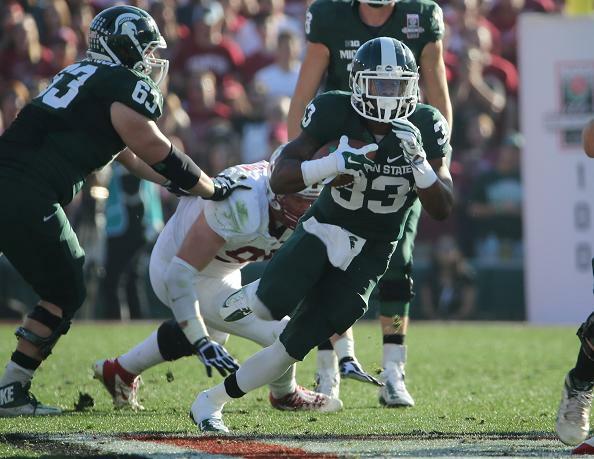 After Stanford’s Gaffney had put the Cardinals on the scoreboard first, Michigan State running back Jeremy Langford rushed in from 2 yards out on the left end for a touchdown in the second quarter to tie the game. Stanford took a 17-7 lead and very much in control of the game after Kevin Anderson intercepted a wayward Cook pass and returned it 40 yards for a touchdown. Cook, who threw for 332 yards in the game, shook off that mistake and led Michigan State 75 yards right back down the field to get the Spartans back in the game. With 28 ticks left in the second quarter, Connor connected with TrevonPendleton for a two-yard touchdown pass to cut Stanford’s lead to 17-14. The turn of events shifted in the third quarter as Michigan State started to make the big plays. The Spartans took the opening drive of the third quarter and drove down the field for a short field goal to tie the game at 17-17. Cook connected with Bennie Fowler for a big-pass play to get the ball deep inside Stanford’s territory. 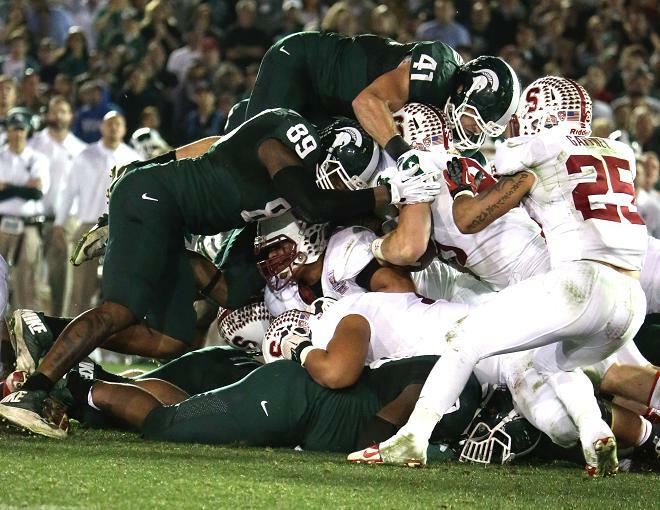 Then the Spartans stuffed Stanford’s on their opening second half possession when they came up with an interception. The momentum looked as if it had shifted to the Spartans’ side. The Spartans then nailed Gaffney in the backfield on fourth down on another important series with time winding down in the third quarter. Michigan State called a blitz package on the play after Stanford had called a timeout to figure things out. The Cardinals and head coach David Shaw guessed wrong on this particular play. The Cardinals then got a break when Michigan State running back Jeremy Langford fumbled the ball at Stanford’s eight-yard line as the Spartans looked as if they were going into the endzone for the lead. However, Cook’s 25-yard scoring toss to Tony Lippett gave Michigan State the lead for good.